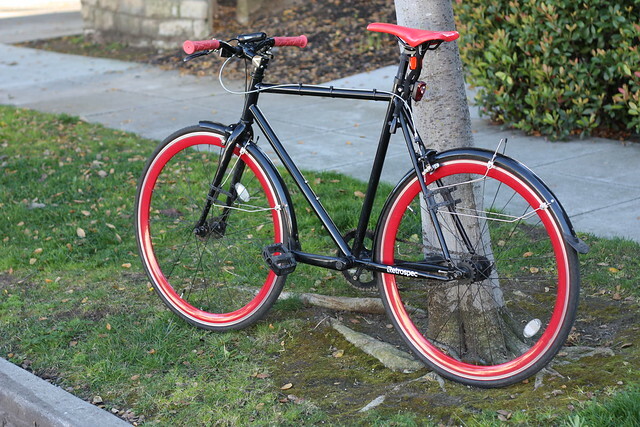 I commuted a few miles a day for two years on a black Retrospec Mantra single-speed bike. I bought it from Amazon for $256 in October 2014. It’s nothing special. Fairly low quality, but appropriately priced. The steel is heavy and the ride is dull. The plastic pedals are clunky and don’t spin particularly freely. The wheels are sturdy. The Kenda KWest K193 tires have been fine. I put ~1200 miles on them and had 2 or 3 flats. Not amazing, but not terrible considering the roads I was on. I added front and rear fenders, a seat lock, and front and rear lights. Total weight including fenders, lights, tires, pedals, and saddle is 27 lbs 11 oz. It comes with a flip-flop hub, which means it can be ridden as a fixed-gear or freewheel by swapping the rear wheel around. It arrived as fixed-gear. I rode it this way for a few weeks and didn’t like it. I found it inconvenient to not be able to coast and freely position the pedals when stopping. So I switched to freewheel. I added a rear brake for redundancy. The original brake pads were awful. Poor braking power and they shredded to nothingness after less than 100 miles. I switched to Shimano BR-6700 Ultegra brake pads and holders and they’ve been great. The brake levers have some wiggle in them, but they work fine. I’ve been happy with it. I don’t worry about it getting beat up on Caltrain. I don’t worry too much when locking it outside. Total cost of ownership has been low. I’ve done no maintenance other than replacing the brake pads and changing punctured tubes. I wish the gear was lower to make going uphill less annoying, but it’s been fine. Buying a single-speed for this commute was a good choice.